July 1978, and the focus is still on the Class 24 passenger diagram! Monday the 10th July 1978, and Llandudno Junction have sent 24047 out on the turn. 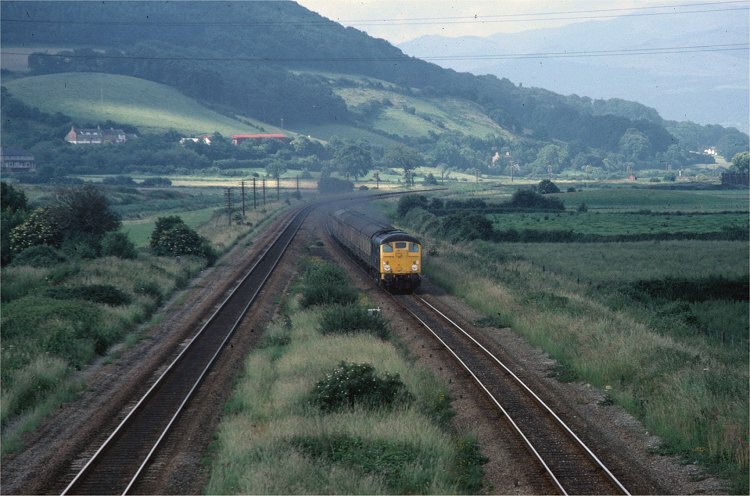 Here, the 1642 from Llandudno to Crewe is seen approaching the Mochdre, betwen Llandudno Junction and Colwyn Bay. Early July turned out to be one of the peak periods for Class 24s working this train, with 9 appearances in 10 days - 4 for 24082, 3 for 24023 and 1 for 24047 (seen here). The ninth day was shared between 24023 and 24063. 24082 and 24023 seemed to be the preferred locos, with a rake of 5 or 6 MK I side corridor coaches. However, a memorable thrash was had behind 24082 on 4th July with 9 on. The train is approaching the site of Mochdre and Pabo station, closed many years before, where the up and down lines split to pass under the road bridge. This view has changed significantly, as it is now the point where the A55 expressway, running to the left of the line from Llandudno Junction, curves to pass under the bridge and take up the former railway alignment.